Beautiful Brands International (BBI), multi-brand franchisor of Camille’s Sidewalk Café, Freshberry & Rex’s Chicken, has received stinging criticism from former franchise owners who allege Beautiful Brands is only interested in collecting upfront franchise and development fees, that BBI provides little-to-no ongoing franchise support, and that Beautiful Brands is indifferent to the widespread failures of its franchisees. Are you familiar with the Beautiful Brands International or their franchise opportunities? Please share a comment – positive or negative – below. Company rebuttals or clarifications are welcome. Some of these allegations appeared as comments on our post regarding the high SBA failure rate of Camille’s Sidewalk Café franchise. Camille’s is listed by the SBA among the worst franchises by SBA loan default. BBI set its highest sales mark to date in 2011, selling more than 370 franchises and master franchise agreements. The company is already on pace to upstage that number, with 200 franchise deals in the first quarter of 2012 alone. In addition, BBI has surpassed last year’s first quarter store openings by more than double, and it has 160 stores under development slated to open in less than 24 months. It seems that Beautiful Brands has turned into a franchise-selling machine. But how is its track record in servicing and supporting franchise owners once their agreements are signed and their checks have cleared? The first Coney Beach unit will open in Tulsa in April . Initial expansion also will include Jackson, Miss., with other targets of St. Louis and Kansas City, Mo., Dallas, Houston, Oklahoma City, Birmingham, Ala., Atlanta, Little Rock, Ark., Omaha and Chicago. The goal is to open 20 locations in 2007, 20 in 2008, and 100 in 2009. I own two territories of a Coney Beach franchise near Brandon, Miss. I never developed them and now the franchisor and I have agreed I have one year to resell these territories. I don’t know where to begin. Thoughts? The Camille’s Sidewalk Café 2011 Franchise Disclosure Document (FDD) indicates that in the beginning of 2008 there were 81 Camille’s franchises open in the U.S..
By the end of 2010, that number had dropped to just 41 U.S. franchises. As of June, 2012, there are 32 Camille’s U.S. locations listed on their website. The Camille’s U.S. franchise network has shrunk 60% since 2008. According to the 2011 FDD, between 2008 and 2011, Beautiful Brands had opened 24 Camille’s locations, but terminated, closed or not renewed 70 Camille’s franchises. 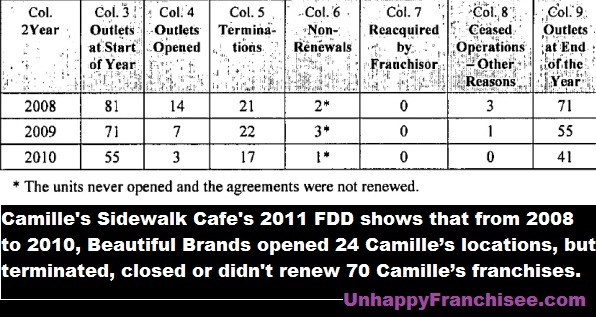 Additionally, the Camille’s FDD shows that there were 20 franchise agreements signed for locations that had not opened. Several franchisees claimed they paid for franchises that they were never able to open. Refunds are not given for undeveloped franchises. According to the Small Business Administration, Camille’s Sidewalk Cafe franchisees have received 66 SBA-guaranteed loans; more than half of those loans have been defaulted on by Camille’s Sidewalk Cafe franchise owners. While Beautiful Brands is aggressively signing up new franchise owners, former franchisees are speaking out (See CAMILLE’S SIDEWALK CAFE Franchise Complaints) about an alleged lack of support and deceptive business practices. Camille’s sidewalk cafe has a high default rate because there is no support. Franchisees cannot get a hold of them and they put no effort into helping them with support…. As a former Camille ‘s Sidewalk Cafe franchisee, we can speak from a painful experience that there is no support from the franchisor. There continues to be a great deal of deception as well in alluding to the so-called “development” of several hundred franchises world wide!! …Camille and David collect their franchise fees, including the required additional development fees, when there is no possibility for development, no support staff, and no enforcement of operational standards. With all of these major problems causing a high rate of restaurant closures, they continue to turn their heads, once they have their money, and move on to other concepts, leaving the franchisee on his/her own to survive with a total lack of support. I am an ex-franchisee of Camille’s who ended up losing every penny I had earned and saved. My family and I lost everything. …in essense this company and it’s leader desire nothing more than to take the money of people they convince their concept is great. I was lied to about food and labor costs and profit margins. Stay away, run as fast as you can, this is nothing more than a scam designed to take your money with no support in exchange. Well I could on w this scenario for pages. Simply put Dave R should be tried and prisoned for the way he treated us and other franchisees. We had purchased rights to 7 locations in MN and opened 2… Although they helped in opening the sites that was it! ARE YOU A BEAUTIFUL BRANDS FRANCHISE OWNER OR FORMER BEAUTIFUL BRANDS FRANCHISEE? ARE YOU FAMILIAR WITH BEAUTIFUL BRANDS FRANCHISE OPPORTUNITY? PLEASE SHARE A COMMENT BELOW. Franchisee Bill of Rights: What Would You Include? I have to say that the one thing that all these franchises have in common is that they are all high priced food that isn’t that great. It would be hard to make a go of any one of these businesses because they under deliver on what they are selling. I have also noticed that the customer service in every one of these places has been less than satisfactory. It is really sad that all these people have lost so much money and the franchiser should be held accountable, should have been some kind of support Claus in the contract or something that would give the franchisee a leg to stand on. Bottom line, over priced food with a bad attitude will not win repeat business. The Rex’s chicken that is in Bixby now has the worst customer service I have ever seen. I have actually walked out of there twice without completing an order because of their absolute disregard for the customer. If you want to be successful with a high price food item you need to deliver incredible customer service…i.e. Chick-Fil-A. They have the best service in the fast food industry and their prices are a little high. Their food is a way higher quality and tastes better than Rex’s but the people are half of what wins the business. That and consistency. Look at that Cherryberry, who wants to pay $9 for their kid to have a healthy yogurt and then cover it with candy??? Does that make sense? Just go to Braums, $2 less calories, less waste. Simple things, made so trivial.that is just my opinion.